It’s a Concept vehicle, but is the Nissan Navara EnGuard a preview of the 2018 Nissan Frontier? Nissan keeps teasing us with different global versions of their mid-size pickup. Nissan recently unveiled an all-new Navara EnGuard Concept pickup at the 2016 Hannover Motor Show in Europe. Is this a preview of the next-generation 2018 Nissan Frontier? If it is, it’s a good model to copy. This Concept vehicle is based on a Double Cab Tekna version of the Nissan Navara, a production vehicle sold in Europe, and it’s the current holder of the International Pick-up Award. The Nissan Concept truck is powered by a 2.3-liter 190PS (187 hp) twin-turbo diesel engine. We know Nissan is toying with the idea of putting a slightly larger 2.8-liter Cummins Turbo Diesel in the next-gen Frontier for the US market. 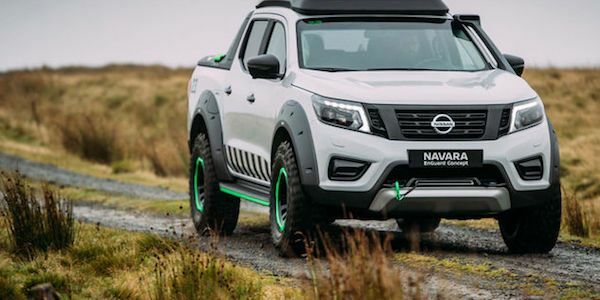 Compared to the standard Nissan Navara, Nissan says the overall ride height of the Navara EnGuard Concept has been raised by 50mm, creating extra ground clearance. The wheel arches feature bespoke overfenders, with new moulded side steps between them. It’s off-road ready. It also comes with a 360-degree camera system which displays “an unobstructed bird’s eye image” of the vehicle and its surroundings on a dashboard screen. It would be ideal for adventure seekers to navigate difficult off-road terrain without causing delays by having to get out of the vehicle. Nissan says it also gets a rugged ladder-frame chassis, featuring a new fully adjustable performance suspension system with uprated nylon bushes to further improve off-road capability. The passenger compartment features a completely redesigned roof line, which is 136mm higher than on the standard Navara. It also gets redesigned front fog lamps and redesigned rear light clusters. It also comes with navigation, heated seats and dual-zone climate control. Could the Nissan Navara EnGuard Concept unveiled at the 2016 Hannover Motor Show be a preview of the next-generation 2018 Nissan Frontier? It would be a great platform to build it on. The exterior styling also gets high marks.